Pricing is for a case of 30 bulbs Sylvania 30W T12 Cool White Fluorescent Light Bulb - F36T12/CW - Description: 30W, 36" MOL, T12 instant start Slimline fluorescent lamp, Cool White phosphor, 4200K color temperature, 60 CRI. Average Rated Life (hr) 7500, Base Single Pin, Bulb T12, Manufacture Sylvania. 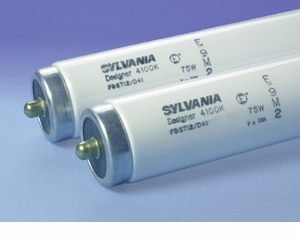 Sylvania 30W T12 Cool White Fluorescent Light Bulb - F36T12/CW - Description: 30W, 36" MOL, T12 instant start Slimline fluorescent lamp, Cool White phosphor, 4200K color temperature, 60 CRI. Average Rated Life (hr) 7500, Base Single Pin, Bulb T12, Manufacture Sylvania.